A diverse group of over 500 women came together last night to join the important discussion about the role of women in society. 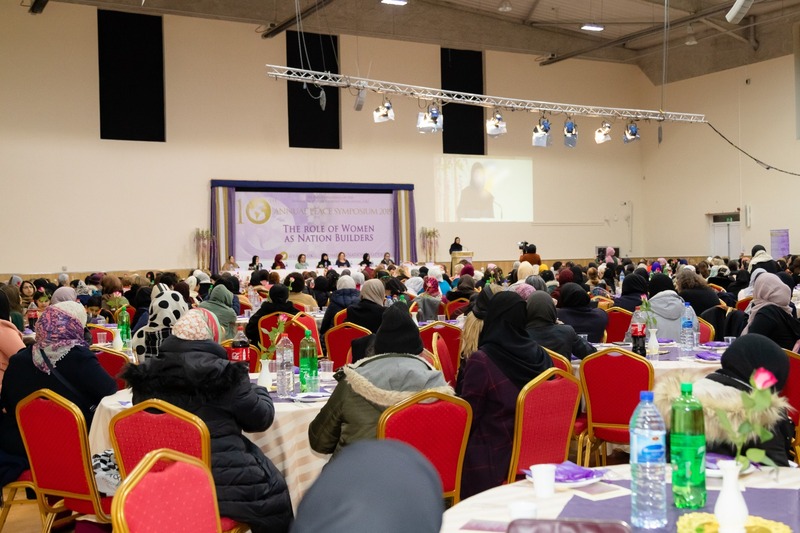 All major faiths and those of no faith were represented at the largest mosque in the UK, Baitul Futuh in south London, for the annual Peace Symposium hosted by the Ahmadiyya Muslim Women’s Association in the UK. 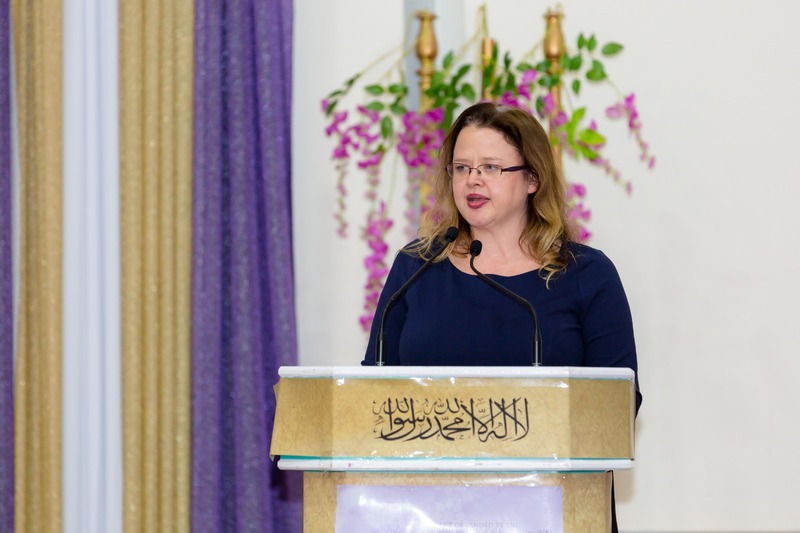 The event brought together women from the worlds of faith, politics and civic society to promote a deeper understanding of Islam and other faiths. Its aim has been to inspire a concerted effort towards lasting societal peace and in this, its 10th year the focus of discussion was the role of women as nation builders. Katie Harrison, Director of ComRes Faith Research Centre and Dr Nazila Ghanea, Associate Professor in International Human Rights Law at the University of Oxford, human rights consultant and co-author of award-winning book, Freedom of Religion or Beliefs presented their respective analyses of the topic. Dr Fariha Khan, President of the Ahmadiyya Muslim Women’s Association UK then presented the Islamic viewpoint on women’s role as nation builders. Attendees posed their questions to members of a panel who addressed a variety of questions such as the nature of Muslim women’s portrayal in the media, what Muslim women can to do counter the misconceived notions about them, the ideal response to unjust treatment, domestic violence and how the Khalifa (Caliph) is elected. A charity cheque presentation of £17,800 raised by members of Lajna UK was made to Leukaemia Care UK. Lively discussions continued over dinner and into the late evening. Attendees had the opportunity to view exhibitions, participate in the Al-Qalam project in which a single verse of the Holy Quran is hand written by each participant towards completing its entire text and were given tours of the Baitul Futuh mosque. 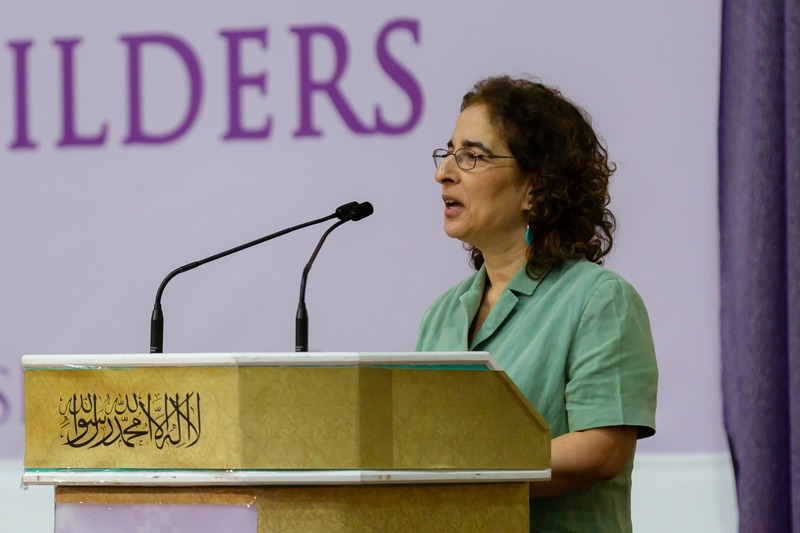 Dr Nazila Ghanea shared her thoughts on peace, how women of faith might contribute. She said, ‘the means of achieving justice should not be unjust in themselves’ She pointed out that women seem to have a higher calling to peace, for sacrifice and for establishing peace between members of our family, between ourselves and our neighbours, and within the community. But that we cannot have any peace if we do not have a voice and if more women enter public life we have a greater chance of achieving peace. Ahmadiyya Muslim Community UK which was established in Britain in 1913. 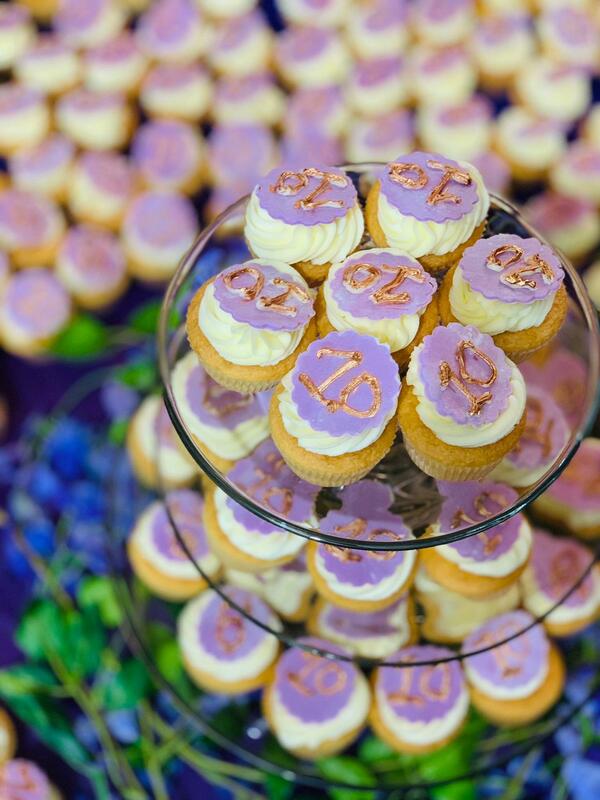 The Community has approximately 33,000 members across more than 100 chapters. The Community built the Fazl Mosque in Southfields London in 1924 which was the first Mosque in London and also the Baitul Futuh Mosque in South London, the largest Mosque in Western Europe. It was founded in 1889 by Hadhrat Mirza Ghulam Ahmad (peace be upon him) who claimed to be the Promised Messiah and Mahdi awaited by all major religions, including the Jews, Christians and Muslims. The Ahmadiyya Muslim Community is now established in 209 countries with tens of millions of members worldwide. Its motto is “Love for All, Hatred for None”. The Ahmadiyya Muslim Community is the largest organised Muslim Community in the world and is led by a system of spiritual successorship known as Khilafat. Its current Khalifa is the fifth successor to the Promised Messiah (peace be upon him); his name is His Holiness, Mirza Masroor Ahmad. His title is Hadhrat Khalifatul Masih V.